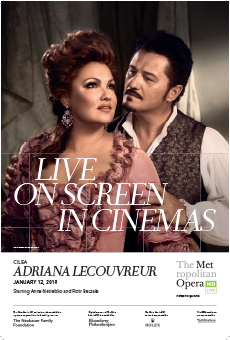 Soprano Anna Netrebko joins the ranks of Renata Tebaldi, Montserrat Caballé, and Renata Scotto, taking on—for the first time at the Met—the title role of the real-life French actress who dazzled 18th-century audiences with her on-and offstage passion. The soprano is joined by tenor Piotr Beczala as Adriana's lover, Maurizio. The principal cast also features mezzo-soprano Anita Rachvelishvili and baritone Ambrogio Maestri. Gianandrea Noseda conducts. Sir David McVicar's staging, which sets the action in a working replica of a Baroque theater, premiered at the Royal Opera House in London, where the Guardian praised the "elegant production, sumptuously designed ... The spectacle guarantees a good night out."